The most useful definition of perspective for media studies found in the Oxford English Dictionary is, “The art of drawing solid objects on a plane surface so as to give the same impression of relative position, size, or distance, as the actual objects do when viewed from a particular point.”  This definition consequently encompasses many different techniques for representational drawing that allow relational inferences to be made between 3-D objects depicted in the two-dimensional world. Implicit is the idea that space, as such, can somehow have dimension. This idea, this scientific rationalization of space, is closely associated with Renaissance attitudes; thus, so is scientific perspective. The invention of the scientific theory of linear perspective is attributed to the architect Fillipo Brunelleschi, sometime around the year 1413 and was first codified by Leon Battista Alberti, on his book On Painting in 1435. Despite the real questions about the efficacy of depicting the space the physical eye perceives as a geometrical construction, linear perspective was seductive as a rule bound, scientific process in an age that celebrated process. Panofsky argues that there is a hand-in-hand relationship between the cultural understanding of space, and the depiction of space. For instance, Panofsky claims, the scientific knowledge necessary to invent linear perspective existed in ancient Greece, possibly in the work of Euclid’s “Optics,” but the conception of space as an infinite dimension did not exist. Consequently, the motive to try to construct space scientifically at that time did not exist either. Joel Snyder, in his essay “Picturing Vision”, has problematized not only Panofsky’s historical account of perspective but also his assertion that perspective was developed to allow artists to rationally pictorialize space. He argues that Alberti’s theory of perspective allowed painters only to represent vision, rather than to rationalize it as perception of Cartesian space as such. The distortions associated with linear perspective can be seen in photography. It is interesting to note that, because light moves in straight lines, the mechanical eye of the traditional camera captures light onto a two dimensional plate in much the same way that the view pyramid of linear perspective organizes space into two dimensions. The healthy human eye has a roughly 140-degree angle of view, but when shown a photograph representing a 140-degree angle of view, we immediately note the distortion that takes place with close objects in the middle of the picture and distant objects at the edges. This discrepancy between camera and physical eye is accounted for in part by the fact that in our eyes, light projects not onto a flat surface, but the curved inner surface of our eyeballs. Furthermore, a large portion of our perception comes from having two eyes that can triangulate relative depth (known as stereopsis, which is a form of parallax), and the ability to move our heads to accrete multiple views of a single object. Parallels exist between the functioning of our vision and photography or linear perspective, but because our vision exists not only in the light that enters our eyes, but also the passage of time, and the interweaving of binocular pictures of the world by our brains in conjunction with our mental image of what we expect to see, the parallel becomes problematic. Artistic practice that developed contemporaneously with photography, such as impressionism and cubism, in many ways reflects this difference. In his published seminar, The Four Fundamental Concepts of Psychoanalysis, Jacques Lacan elaborates his concept of the gaze (c.f. eye and gaze [link]), which has some conceptual parallels to linear perspective. Lacan discusses this in the section entitled “Of The Gaze As Objet Petit a”. Viewing pictures, Lacan argues, operates within his notion of the scopic drive, which is the drive of minded individuals to be whole under the gaze of the Other. In this system, the perspective picture operates not only as a frame or mirror, but also as a screen which can obscure the subjects reciprocal or circular relationship with the Other. To show this, Lacan presents a diagram of a doubled perspective pyramid, with the screen/image located directly between the two “eyes” that of the subject, and that of the Other (c.f. the keyword entry on the screen [link] for this image). There are other systems of representation that differ from linear perspective. One mentioned already are the various theories of non-linear (or, aerial) perspective, which establish spatial relationships between painted objects in a non-geometrical fashion through gradations in color and shadow, and by overlapping and reducing texture and detail in far away objects (i.e. reduced acuity). Most of these techniques developed alongside linear perspective and were often used in combination with it. Another system of depicting spatial relationships is non-convergent perspective, familiar as the isometric and axonometric systems of architectural and engineering drawing. This form of perspective does not purport to represent visually “correct” space, as such, but rather the relative positions of objects within space. In isometric systems, the relative height, width, and depth of objects is maintained, which allows accurate measurements to be taken from the drawings. In addition to technical drawing, the ease with which isometric rules can be applied to computer pixels has led many computer games and simulations to use these systems of perspective. 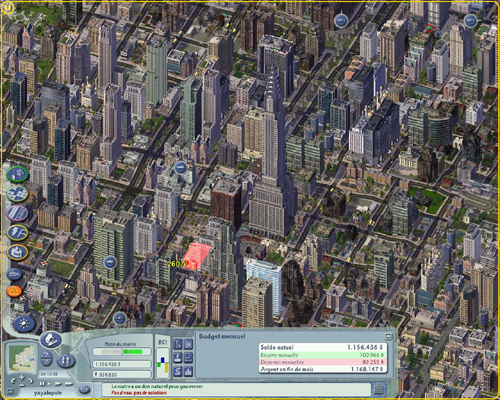 The SimCity series is a notable example. In the book Architectural Representation and the Perspective Hinge, Alberto Perez-Gomez and Louise Pelletier examine the role that two-dimensional representation, including linear, isometric, and computer generated perspective systems, plays in architecture. Their argument is that, since the Middle Ages, architects do not produce buildings, per se, but instead produce images of buildings, so that all physically constructed space is somehow inflected or mediated by representation—by an invisible perspectival hinge. Consequently, the mediation that perspective creates between the physical world and our psychophysical understanding of that world is concretized not only in images (such as painting or photography), but also in the physical world. The geometric, rule-based nature of linear perspective has made this form of representation useful in digital rendering and virtual reality. In his book The Reconfigured Eye, William Mitchell marks a distinction between photography and computer generated perspective, where photography (purports to) represent the actual world, whereas computer rendering fabricates a fictional world from which any number of images might be taken. He writes, “Computed perspectives…insert our disembodied viewing presences into modeled, fictional worlds…our perceiving faculties are pried apart from our corporeal existence and sent to places where our bodies cannot follow” . Although Mitchell’s view of photography might be seen as problematic by art historians such as Joel Snyder and Neil Walsh Allen (c.f. “Photography, Vision, and Representation”), it nevertheless emphasizes a similarity between perspective in painting and in its digital cousins. Indeed, Mitchell notes the strikingly similarities between the story of the development of linear perspective in the Renaissance, and the development of the practice of computer rendering, as tracked by the proceedings of the annual SIGGRAPH5 conferences. This development, especially as it relates to CGI and digital film, is a quest for “accurate” representation, in which ghostly other worlds are created and imbued with a sense of dimension as life-like as possible. 1. “Perspective.” Oxford English Dictionary, on-line edition. Oxford, accessed January 25, 2007. 6. 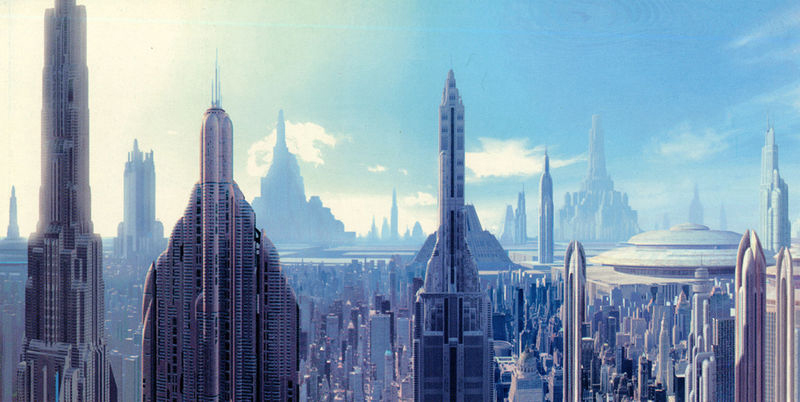 Image: http://en.wikipedia.org/wiki/Coruscant, accessed January 25, 2007. Alberti, Leon Battista. On Painting. Translated by John R. Spencer. New Haven: Yale University Press, 1956. Kemp, Martin. The Science of Art: Optical themes in western art from Brunelleschi to Seurat. New Haven: Yale University Press, 1990. Lacan, Jacques. The Seminar of Jacques Lacan, Book XI: The Four Fundamental Concepts of Psychoanalysis. Edited by Jacques-Alain Miller. Translated by Alan Sheridan. New York: W. W. Norton & Company, 1998. Mitchell, William. The Reconfigured Eye: Visual Truth in the Post-Photographic Era. Cambridge, Mass: The MIT Press, 1992. Panofsky, Erwin. Perspective as Symbolic Form. Trans. Christopher S. Wood. New York: Zone Books, 1997. Pedretti, Carlo. Leonardo da Vinci on Painting: A Lost Book (Libro A). Berkeley, California: University of California Press, 1964. Pérez-Gómez, Alberto and Louise Pelletier. Architectural Representation and the Perspective Hinge. Cambridge, Mass: The MIT Press, 1997. Oxford English Dictionary, on-line edition. Oxford, accessed January 25, 2007. Snyder, Joel. “Picturing Vision,” in The Poetics of Space. Edited by Steve Yates. Albuquerque: University of New Mexico Press, 1995, 157-171. Snyder, Joel and Neil Walsh Allen. “Photography, Vision, and Representation,” in The Philosophy of the Visual Arts. Edited by Philip Alperson. Oxford: Oxford University Press, 1992, 289-305.